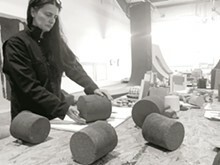 Christine Corday at work in her studio. Space is deep, to quote Hawkwind, and yet scientists believe all living creatures on Earth contain stellar elements within their genetic makeup. Artist Christine Corday explores this union of humans and the stars in her new exhibition Relative Points, which was commissioned by the Contemporary Art Museum St. Louis. Eleven of Corday's large sculptural forms, which are each made of more than 10,000 pounds of elemental metals and metalloid grit, will be arranged within the museum in a pattern of Corday's choosing. The sculptures, which resemble slightly squashed black marshmallows more than four feet high, are intended to be touched; they're essentially the same base elements as humans, after all. During the course of the exhibit, the shapes will change gradually from repeated contact and the inexorable force of universal gravitational attraction. You'll have your first opportunity to get close and personal with Corday's work at the opening reception, which takes place from 7 to 9 p.m. Friday, January 18, at Contemporary Art Museum St. Louis (3750 Washington Boulevard; www.camstl.org). Christine Corday: Relative Points remains fixed in space through April 21.